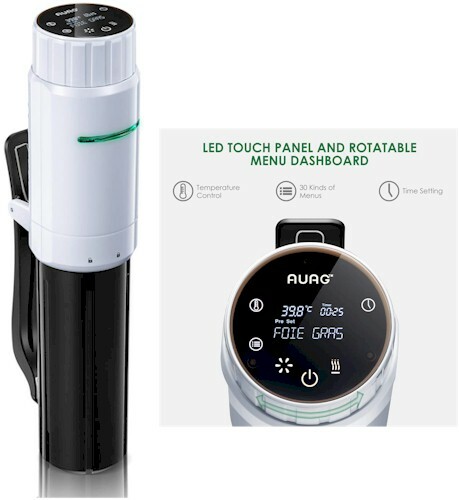 Amazon has got this AuAg Sous Vide Immersion Cooker priced at $58.99, but enter promo code 44SSVZZE at checkout and that price will drop to $33.03 with free Prime shipping. 5.0 out of 5.0 stars over 4 customer reviews. Intelligent Recipes: The sous vide cooker provide 30 kinds of recipes from the world's top chef in the system. By rotating or touching the menu dashboard, you can deliver great meals for your family. Perfect Doneness and Accurate Timer: Digital control panel makes the temperature accurate to 0.1°F and time to minutes. Wide range of temperature (25-99.9°C)(77°F-211.8°F) and timecontrol (Max 99h 59mins) allows you to cook any type of food you like and Sous vide cooking retains more nutrients and vitamins than other cooking methods. Reliable and Quiet Operation: To use it, just put the device in any pot and fill with water. There’s a anti-skip clamp on the back for the pot to make make sure it does not fall off. And it’s ultra quiet when using, won’t disturb the sleeping baby. Leakage Protection Plug: AuAg immersion cooker provide a safer cooking environment for your family, leakage protection line and weak current protection system keep your family away from security risks. Safety&Warranty: This sous vides cooker have been certified by FCC, FDA, ETL. We offer 2 years warranty and our best customer service 24/7 ready to solve any question or issue.